The Rick Hansen 25th Anniversary Relay travels into Calgary, Alberta. The relay is celebrating difference makers and sharing their inspirational stories with the next generation. This was a very special time for Chris Wheeler Media as we spent some more time hearing the stories of these inspirational Difference Makers. They really do show the next generation of what is possible and to never give up. One of the Medal-Bearers, an 18 year old named Julie Macdonld, shared her difference maker story with us: “A year ago a very close friend of mine was injured in a ski accident, which left her paralyzed. Her experience exposed me to the world of spinal cord injury and those who have gone through it, live with it, and have recovered from it. I have since been interested in learning more about the injury and the lifestyle afterwards, which is where I came across the Rick Hansen Foundation. I was inspired by his work and decided that his efforts were something I wanted to support. In my friend’s honor I organized a wheelchair relay event to raise funds and awareness for those living with disabilities. We raised over 72 thousand dollars and donated all of it to the Rick Hansen Foundation. We hope to make the event an annual occasion in support of the foundation and all of those living with the effects of spinal cord injury. I am now in my first year of university studying Human Kinetics and working towards a degree in occupational therapy”. 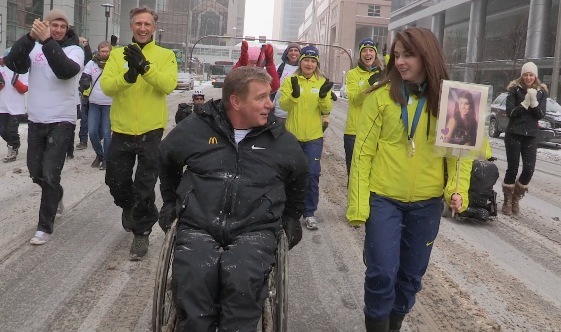 Difference Maker Julie Macdonald and the Man In Motion Rick Hansen in downtown snowy Calgary during relay. Hearing these stories of how people have overcome all odds sure makes one think about what life throws us and how we handle it. These Difference Makers choose to continue on, support and inspire others.